U.S. exports of ethane have increased from nearly nothing in 2013 to an average of 260,000 barrels per day (b/d) through the first 10 months of 2018, accounting for about one-sixth of the country’s hydrocarbon gas liquids exports. The United States became the world’s top exporter of ethane in 2015, surpassing Norway, the only other country to ship ethane internationally. 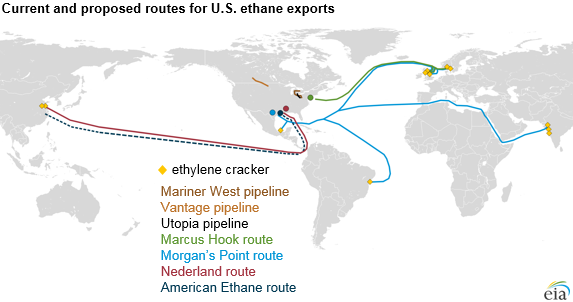 In 2014 and 2015, all U.S. ethane shipments went to Canada, but in 2018 the country sent ethane to 10 countries. According to a report from the U.S. Energy Information Administration, U.S. ethane production grew 74%, from an average of 1.0 million b/d in 2012 to 1.7 million b/d in the 10-month period from January to October 2018. Since early 2014, when the United States first exported ethane by pipeline to Canada, further infrastructure additions have enabled exports of ethane to grow and expand their geographic reach. Two more pipelines to Canada and two marine terminals, capable of shipping super-cooled ethane overseas, entered service in early 2018. Altogether, current U.S. export capacity totals nearly 450,000 b/d, and the United States now supplies ethane to Brazil, Canada, India, Mexico, Norway, Sweden, and the United Kingdom. Additionally, Energy Transfer Partners is planning to build its second ethane export terminal along the Gulf Coast in Nederland, Texas. The Orbit Ethane Export Terminal, planned for completion in late 2020, will have the capacity to export 175,000 b/d of ethane overseas, with 150,000 b/d of that capacity already committed to Satellite Petrochemicals of China.